Tomatoes: technically a fruit and definitely sweet but still not generally considered dessert material. However, that’s changing as forward-thinking pastry chefs seek to redefine the summery produce. 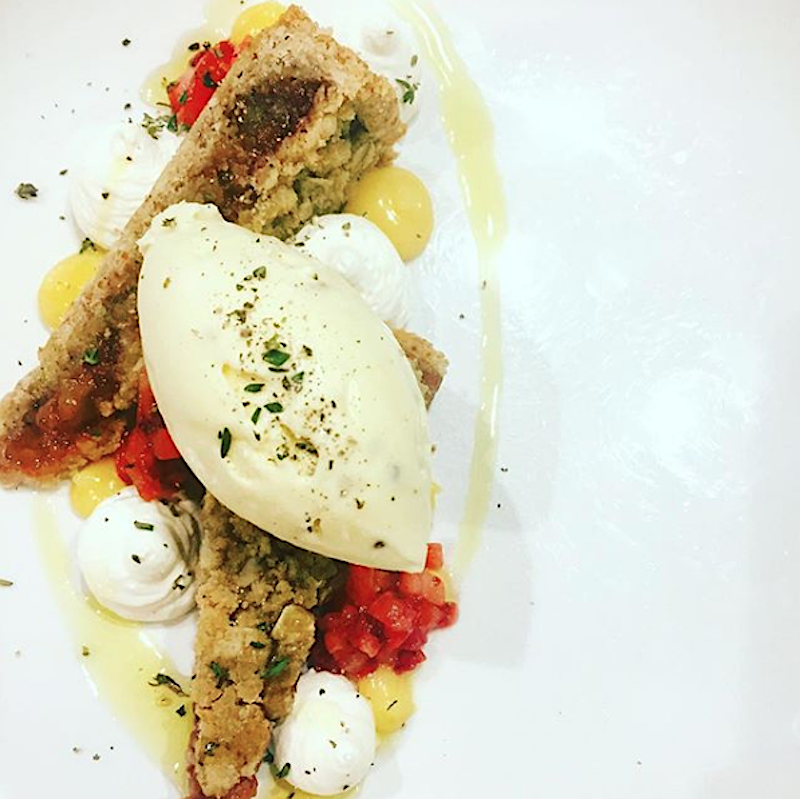 Here are six restaurants for sweet tomato desserts that will make you wonder why you haven’t always been enjoying them as an endpoint to your meals. Nopa Kitchen + Bar, Washington, D.C. 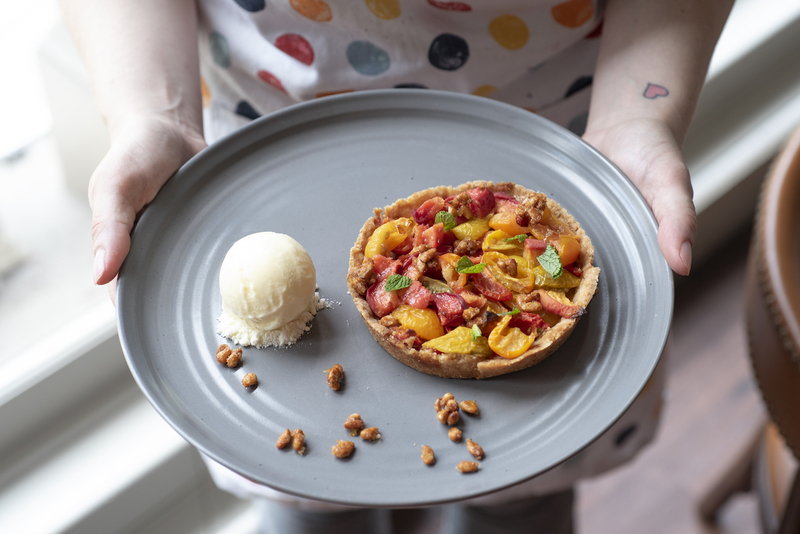 Tomatoes and peaches live together in harmony in this pretty tart dappled with fresh mint. An orb of buttermilk ice cream and honey roasted pine nuts add more summery flavors. As if that wasn’t enough, the restaurant also offers a vanilla bean cheesecake gussied up with tomato-strawberry compote and basil gel. 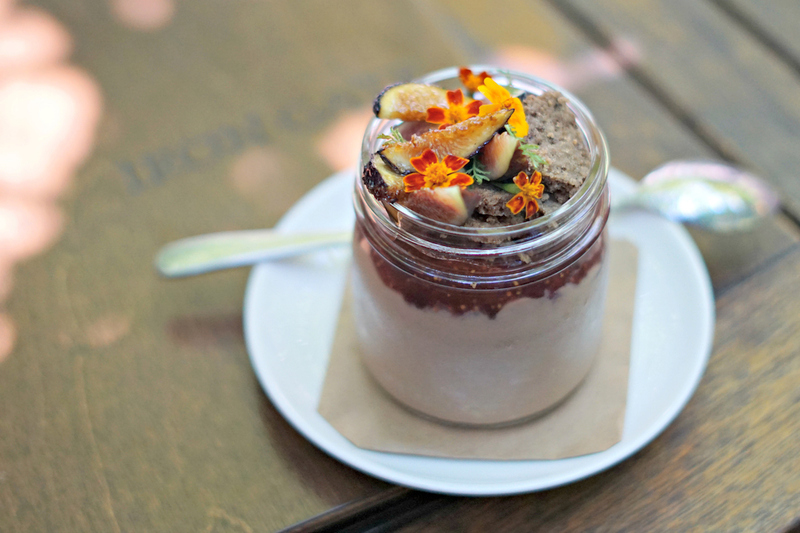 Make a reservation at Nopa Kitchen + Bar. You say to-may-to, I say to-mah-to. 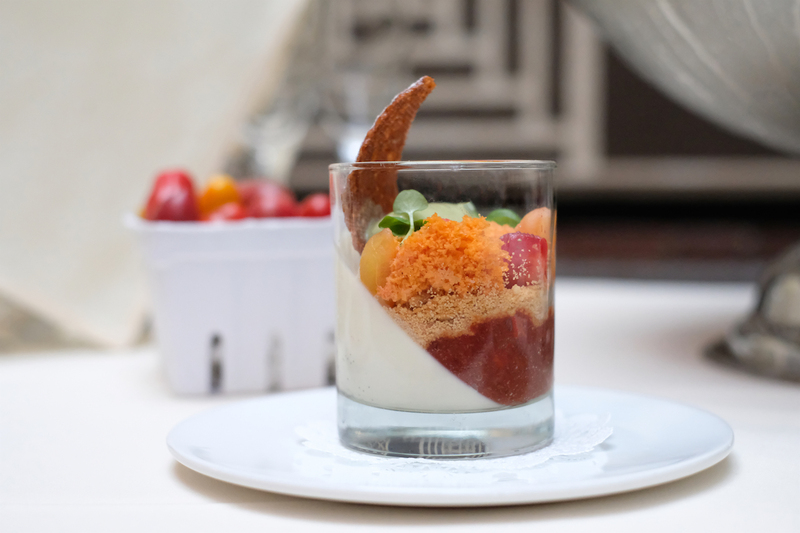 Executive pastry chef Tyler Verbiak says tomato-strawberry verrine. 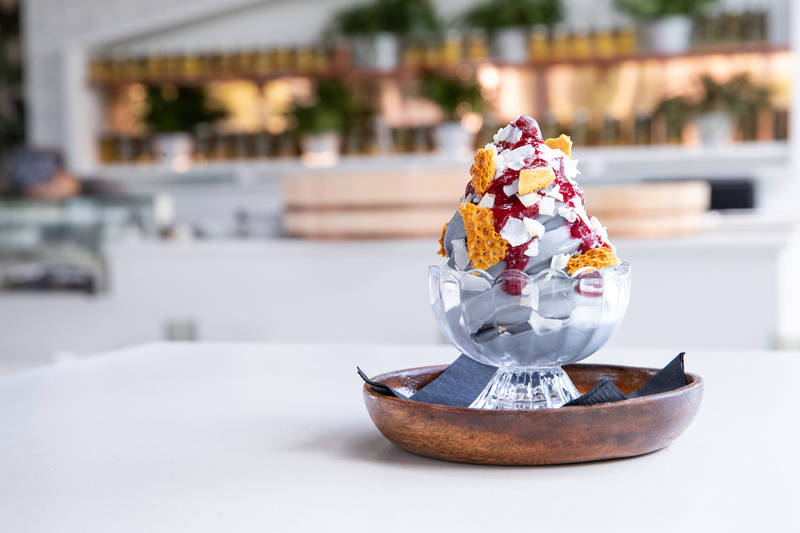 The terrarium-treat is filled out with lemon verbena panna cotta, pine nut sablé, and basil sorbet. Make a reservation db bistro moderne. Pastry chef Paola Valez’s desserts always display a deep creativity. Case in point is her milk chocolate and rum budino. The pretty pudding is topped off with figgy tomato jam, salty buckwheat crumb, and fresh figs. Make a reservation at Iron Gate. Sweet meets savory with a dash of herbaceousness. Slivers of strawberry-tomato tart are complemented by olive oil ice cream. Whipped mascarpone cream, black pepper, and thyme finish out this picture perfect confection. Make a reservation at Trust. 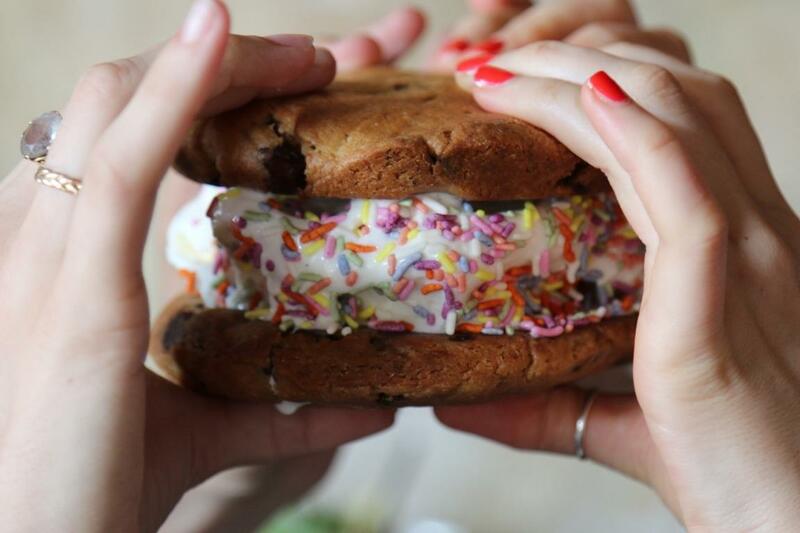 Growing up, one of the best parts about summer was enjoying ice cream sandwiches. The crunch of the cookies contrasted wonderfully with the smoothness of the scoop, making the frozen finales feel like a double dessert. 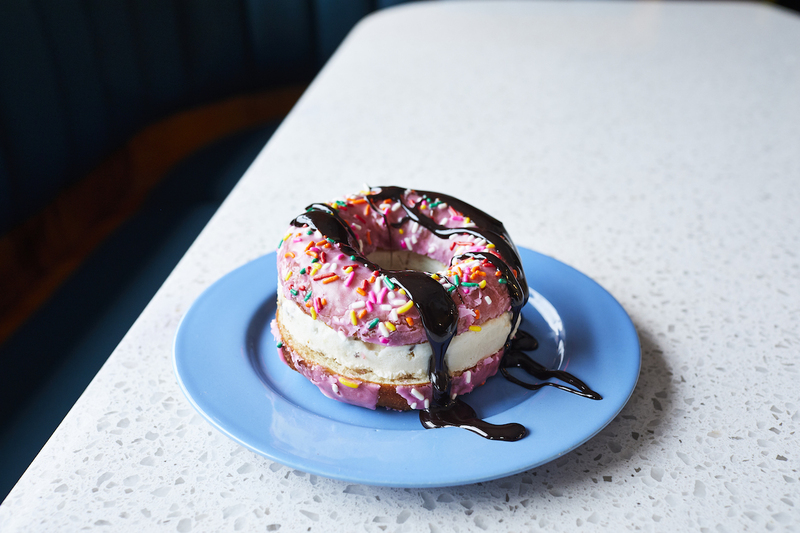 Here are 10 restaurants for ice cream sandwiches that will make your inner-child oh-so-happy as the season draws to a close. These ice cream sandwiches have all the flavors of a s’more: chocolate, marshmallow, and graham crackers. All that’s missing is the campfire and an unfettered view of the stars. 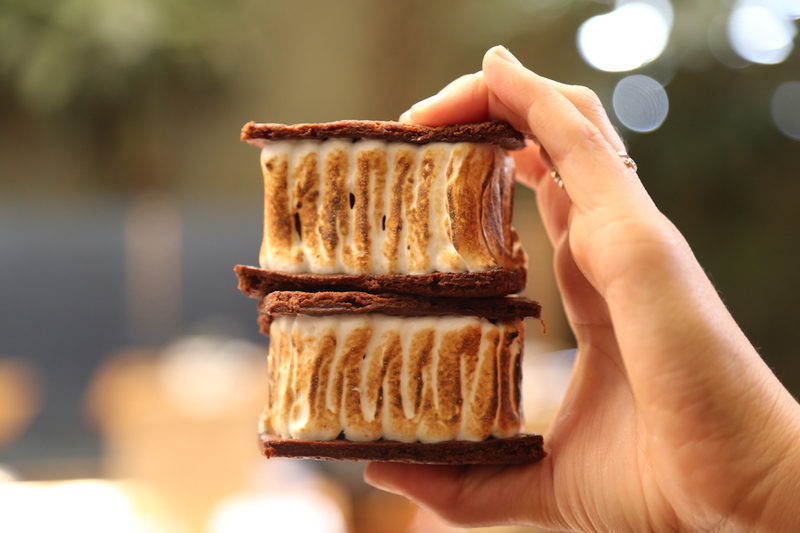 But you won’t mind, because you’ll be getting your s’mores fix like never before. Make a reservation at Hinoki & the Bird. Sometimes simple is best. Malted chocolate chip cookies hug a generous puck of vanilla ice cream. For a finishing touch, the sweet treats are dipped in chocolate chips. Make a reservation at Summer House Santa Monica. How do you improve an ice cream sandwich? Use doughnuts instead of cookies, of course! Sweet circlets covered with sprinkles and chocolate syrup embrace a rotating scoop. Make a reservation at The Mockingbird. Executive pastry chef Fabrice Bendano puts a French twist on the classic. 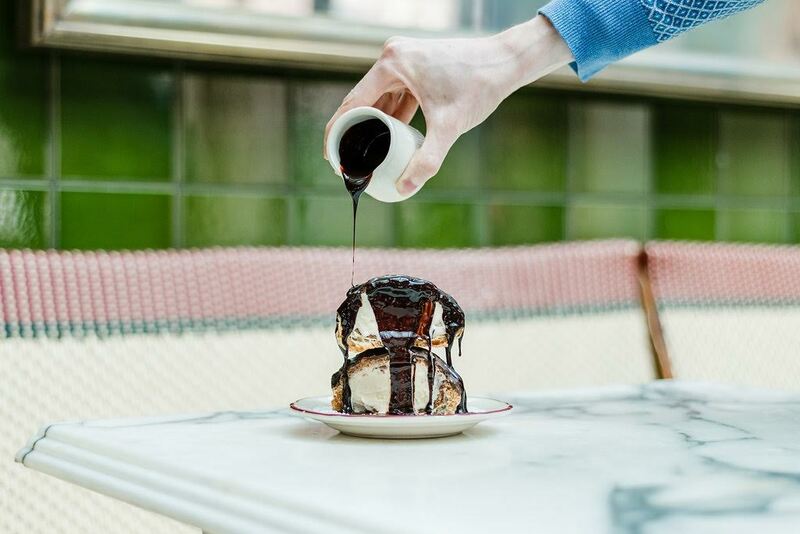 He stuffs crunchy profiteroles with ice cream and fresh banana slices, and then douses the spheres with chocolate sauce. C’est magnifique! Make a reservation at Le Diplomate. The Giant Ice Cream Sandwich lives up to its name. A pair of cast-iron chocolate chip cookies bookend vanilla ice cream gussied up with rainbow sprinkles and chocolate crisps. Sharing is suggested, but we won’t judge if you scarf it down solo. Make a reservation at Boulton & Watt. 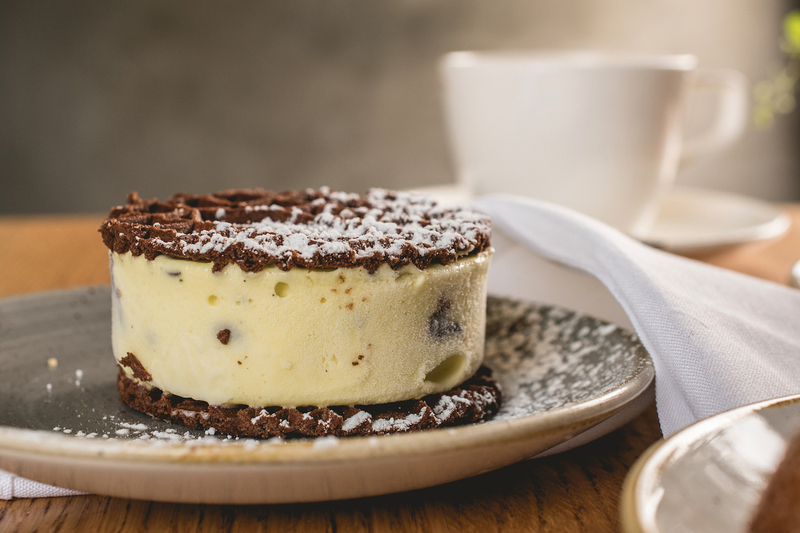 These ice cream sandwiches have an Italian accent. Various gelato flavors are clasped between a pair of pizelles, traditional Italian waffle cookies. È fantastic (That’s fantastic)! Make a reservation at Fi’lia. 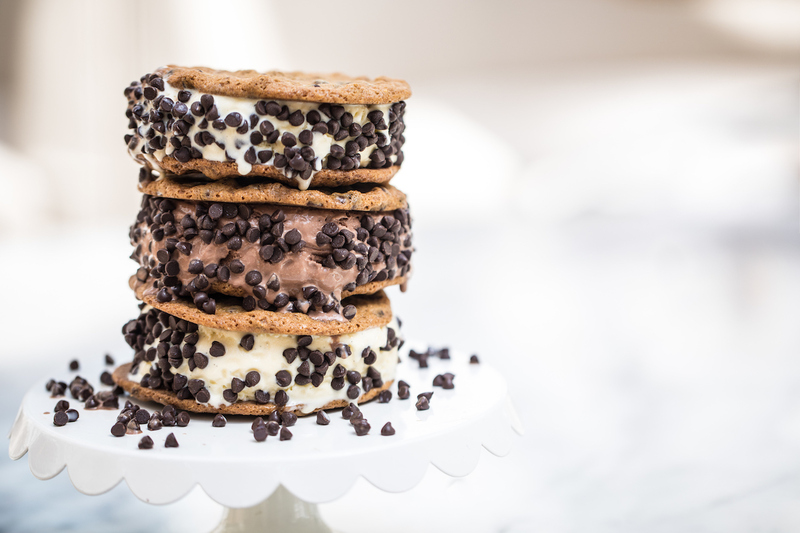 You’ll be drunk in love with this ice cream sando – literally. That’s because the smooshed scoop is made with zwack, a Hungarian amaro. 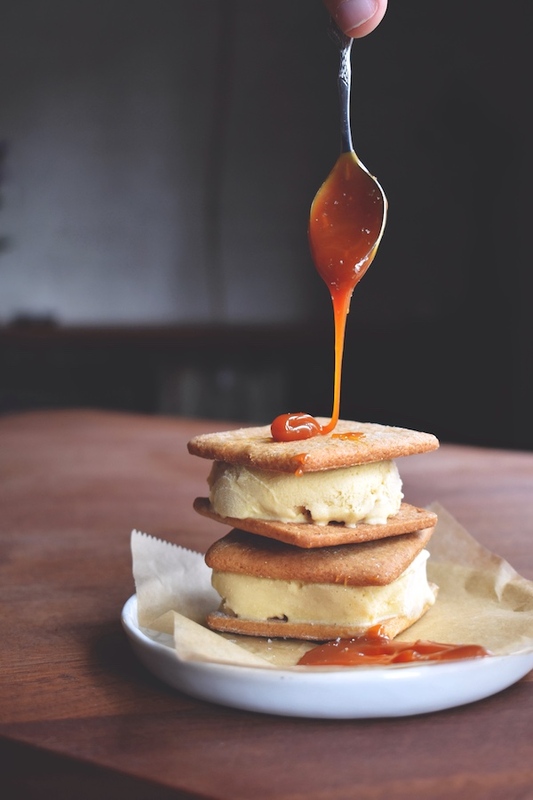 Rye graham crackers and a drizzle of peanut caramel complete the boozy finale. Make a reservation at The Eddy. When summertime rolls around, we go into blueberry overdrive. We love their complex sweetness that hides a touch of tanginess. Here are 11 blueberry desserts that make us wish autumn would never come. Half-moons of peach and plump blueberries mingle in this summery pie with a sugar-crusted, buttery crust. Available by the slice at lunch and dinner, if you fall in love, you always take a whole pie home. Make a reservation at Wildfire. This artful dessert is almost too beautiful to eat. Almost. 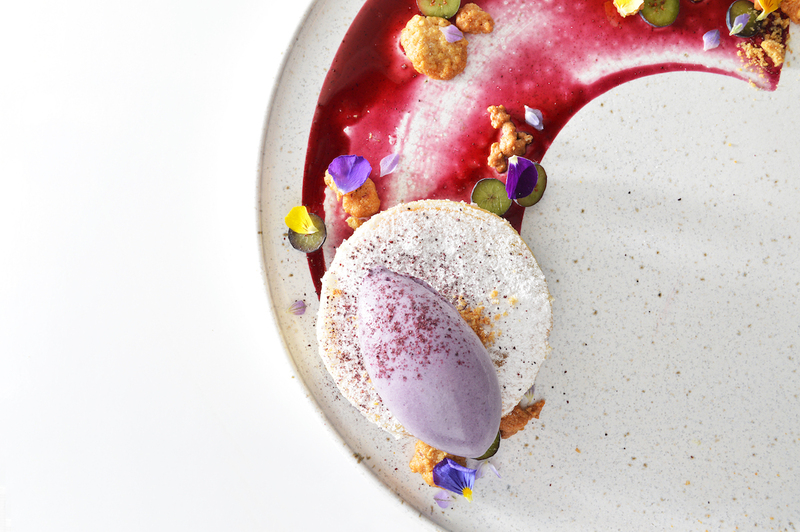 A quenelle of blueberry ice cream, crumbled oatmeal cookie, and fresh viola petals complement a dainty custard cake. Make a reservation at Travelle Kitchen + Bar. 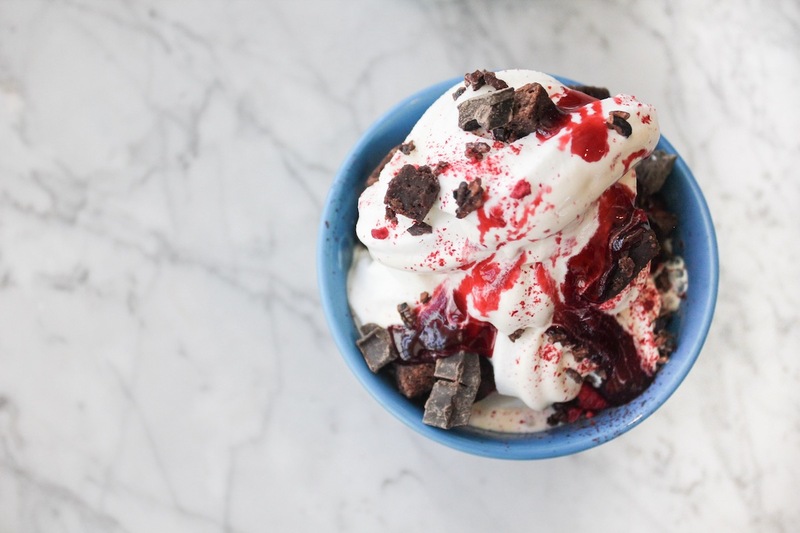 All the summer things make an appearance in this sundae. 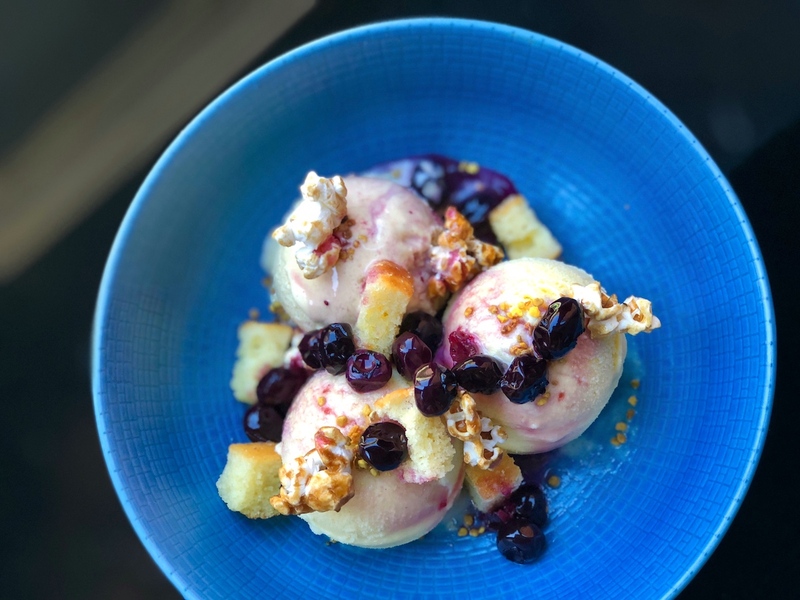 Blueberries, bee pollen, cornbread croutons, and caramel corn gussy up sweet corn ice cream and burnt honey ice cream. All that’s missing are the fireflies and a whole lot of nothing to do. Make a reservation at Little Park. Blueberry muffins are transformed into warm-from-the-oven bread pudding. A sphere of vanilla bean ice cream provides a pleasantly chilly contrast. To finish the dessert off, it’s doused with white chocolate sauce. 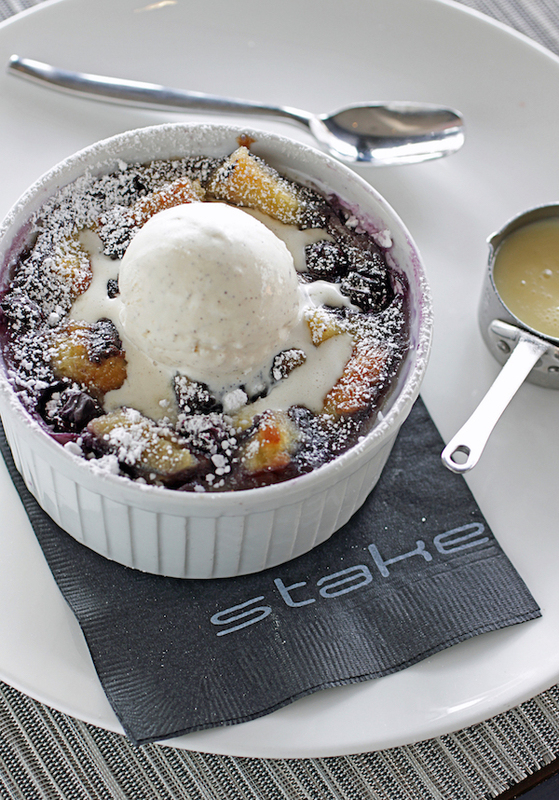 Make a reservation at Stake Chophouse & Bar. 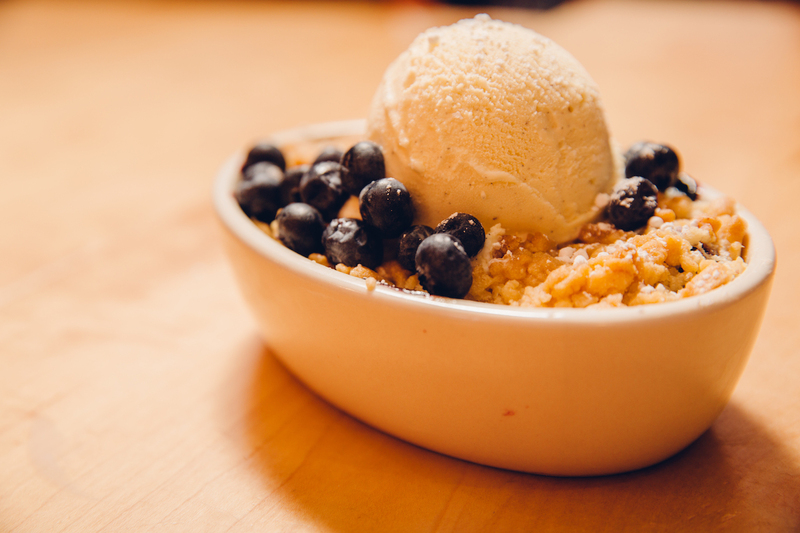 Summer hasn’t officially happened until we’ve dug into a blueberry cobbler. This blue-ribbon version is the perfect way to celebrate the season. 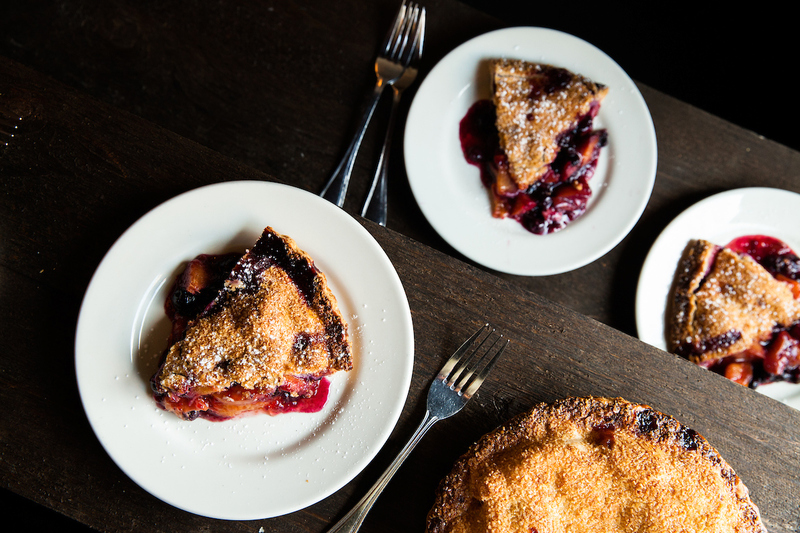 Each bite of berries, butter crust, and vanilla ice cream reminds us why we love the warm weather months so much. Make a reservation at Mity Nice. 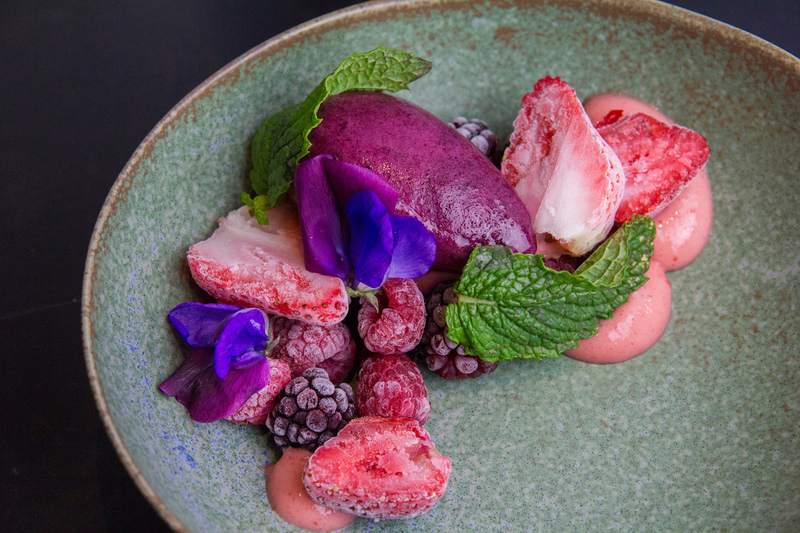 Blueberry sorbet adds a dash of panache to this vegan dessert. Tofu panna cotta and a scattering of berries complete the pretty presentation. Don’t forget to score a snapshot for your Instagram before you dive in. Make a reservation at Onsen. Executive pastry chef Erika Chan double-times as a construction worker to build this towering treat. She begins by layering inverted puff pastries with cardamom pastry cream. 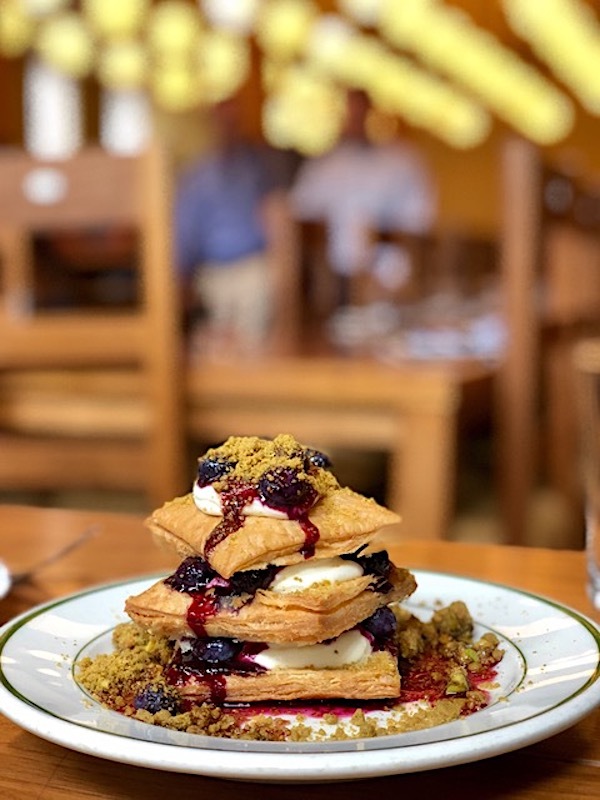 She finishes off the sweet stack with fresh blueberries, blueberry jam, and cardamom-pistachio crumbles. Make a reservation at The Publican. Having a hard time coping with the hot weather? Soft serve is the answer. Rather than offering up simple vanilla and chocolate, these restaurants are giving cone heads more creative options. 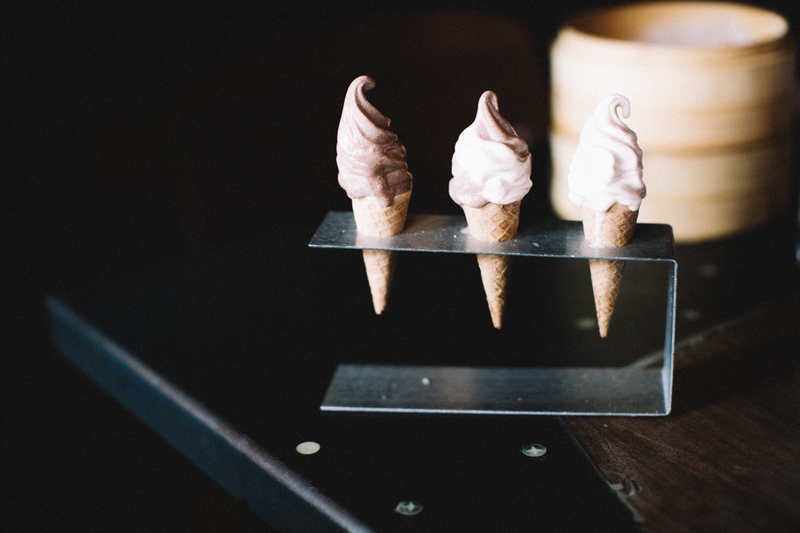 These six restaurants for soft serve ice cream will help you lick the summer blues away. This soft serve has a rich purple hue. The regal color is thanks to the charcoal in it. A substantial swirl of the ice cream is finished off with freshly shaved coconut and other toppings. Make a reservation at Planta. Start with a bowl or cone of salted caramel or vanilla. Then add on your choice of chocolate sauce, caramel sauce, raspberry caramel, brownie bites, chocolate coffee beans, rainbow sprinkles, and chocolate chunks. No matter what you choose to do, there are no wrong decisions. Make a reservation at Dutch & Doc’s. The bases are vanilla, chocolate, or swirl. However, it’s all about getting an additional flavor blast of strawberry, orange, butterscotch, bubble gum, butter pecan, or another addition. Finish off your tasty turret with toppings like Butterfingers, M&Ms, sprinkles, gummy bears, and Oreo crumbles. Make a reservation at Seaside on the Pier. 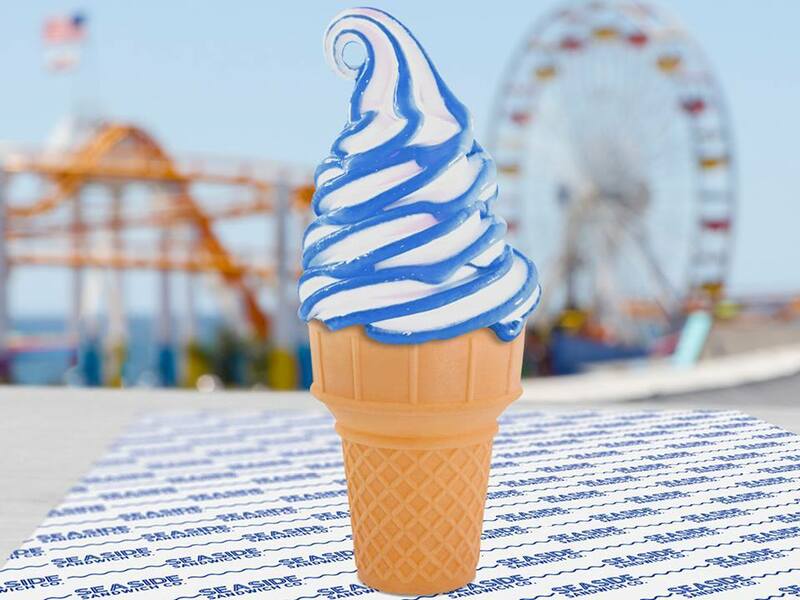 You’ll never get bored here because the soft serve flavors change every two days. Options might include mint chocolate, tiramisu, malted vanilla, peaches, and cream, or one inspired by an Almond Joy candy bar. No matter what, you’re in for a treat. Make a reservation at Sampan.